You and your team, Atlanta United, are set to play in your first MLS Cup final on Saturday. How are you preparing for it? It's exciting. Every player wants to be in a position where you're competing for trophies. Coming into the league, my goal was to win the MLS Cup. At the same time, it's still just another 90 minutes of soccer that you have to focus on at the end of the week. I want to enjoy it, embrace it, and really be in the moment. A number of young Americans have come to Germany to play football. However, not so many Germans have moved in the opposite direction. How did you decide to go to the United States and play college soccer? Was it more a sporting or a life decision? It was a life decision first and foremost. I still wanted to be a professional soccer player and I probably would have gotten a chance to do so in Germany, but I wanted to study at the same time and be prepared if it didn't work out. I didn't see that possibility in Germany. I'm happy here and happy with my decision. How did the move affect your development as a player? I think it helped my development a lot. I've always been a bit of a late bloomer, and when I came over here, I wasn't quite ready to turn professional. Knowing that I was going to be at school for three or four years, there was less pressure at first. You don't have to worry about fighting for a contract, so you can just focus on yourself and developing as a player and person. Atlanta United have been drawing an average attendance of over 50,000 to their home games and the Mercedes-Benz Stadium is known as having one of the best atmospheres in MLS. How does the fan culture in North America there compare to Germany? In Germany, not everyone goes just to cheer and be entertained. They go to enjoy the game, but they are also more analytical and critical. Here, I think nearly all of the fans really are mainly out to be entertained. 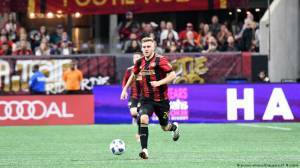 You are not the only German on Atlanta United; there is also former Sandhausen and Eintracht Braunschweig midfielder Kevin Kratz. Does it help having a fellow countryman on the squad? Yeah, Kevin and I have become really close friends ever since we both arrived here. We have taken different paths to get here, but he's a great guy. He tells really great stories about the German second division and the Bundesliga. He's helped me out as a player as well, giving me advice, and I have benefit tremendously from that. It's also nice to speak German here and there. If you two win the Cup, will you be the most famous Germans in the league? Or is Bastian Schweinsteiger simply too big a name? (laughs...) It is a bit tough. I mean Schweinsteiger is great, what he's accomplished in his career is very unique and a tremendous success. At the same time, we'd be the first [Germans] to win the MLS Cup, which would be special. Speaking of Schweinsteiger, the perception of a lot of Europeans is that MLS is a league where older stars go, but Atlanta have reached the Cup with a roster filled with young American and South American players. Is MLS changing? I think it's definitely changing. It's moving towards what we have here, where we have a lot of South Americans, players who aren't at the end of their careers. Lots of guys are coming here with big ambitions, to eventually take that next step and play in Europe, and I kind of see the entire league moving in that direction. Of course, your focus is on the final, but have you thought at all about coming back to Germany and pursuing your career here in the future? You never really know what's going to happen in your soccer career. Things can happen quickly, things sometimes don't happen the way you want them to. I still have two years on my deal here and would be very open to getting a new contract here as well. At the same time, I grew up in Germany watching the Bundesliga, so if I were to get the right opportunity, I would love to go back and give it a try. Julian Gressel, 24, came up through the Greuther Fürth youth academy and played for Eintracht Bamberg of the fourth-tier Regionalliga Bayern before moving to the United States in 2013 to play for Providence College. The German midfielder was drafted eighth in the 2017 MLS Super Draft by then-expansion team Atlanta United. He recorded five goals and nine assists in his first season, earning him the 2017 MLS Rookie of the Year award. Gressel and Atlanta United face the Portland Timbers in the MLS Cup final on Saturday, December 8. The interview was conducted by Dave Braneck.